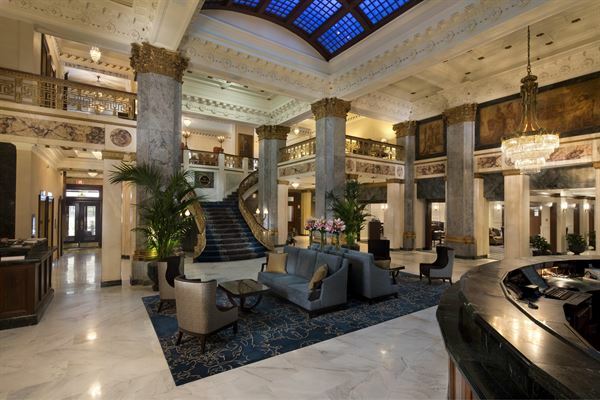 Historic Downtown Hotel with Old World Charm and modern amenities. Featured in The Great Gatsby as the setting for Tom and Daisy Buchanan's wedding, The Grand Ballroom's 4,900 square feet of space is an ideal venue for special catered events and receptions. Located on the 10th Floor of our hotel, this elegant ballroom boasts marble wall accents, palladium windows, crystal chandeliers and a welcoming fireplace. And if you need more space, you can expand your gathering into The Foyer's 1,780-square-foot space adjacent to The Grand Ballroom. The Foyer can be used alone and is perfect for social events and meetings for up to 200 guests. The exquisite style of our Main Lobby continues into the nearby Medallion Ballroom. Featuring 20-foot ceilings and grand chandeliers, this ballroom will add an elegant atmosphere to any event. All lighting is controlled electronically, and state-of-the-art production services are at your disposal. It is also easily divisible into six sections, giving you diverse meeting options and producing spaces ranging from 375 square feet to 2,013 square feet. And, if you need more space, the adjoining Medallion Foyer provides another 5,000 square feet for your event, making it an ideal room for silent auction tables, registration and receptions. Opened in 1907, the Rathskeller offers a setting different from all others — unique in architecture and distinct in design and detail. The only surviving, Rookwood-Pottery room in the world. This 4,200-square-foot space is ideal for catered events for up to 280 people, banquet-style, or up to 300 guests for receptions. Your guests will be delighted by the stunning medieval architecture that marks the Rathskellar's interior. They'll dine under a spectacular, red-tinted, terra-cotta ceiling, with columns ringed by Rookwood-Pottery pelicans — a sign of good luck. Tile designs on the Rathskeller's walls depict walled cities in the Rhenish region of Germany, where the Seelbach's founders, Otto and Louis Seelbach, were born. Further design detail is found back near the oak bar. An artistic ceiling made of fine-tooled leather and painted in a heraldic design with the twelve signs of the zodiac, creates a one-of-a-kind atmosphere for mingling and socializing with drinks. The Oakroom at the Seelbach Hotel is a must-see venue in Louisville and has been recently featured on The Travel Channel, History Channel and Science Channel. Opening as a gentleman's billiards parlor in 1907, it has hosted numerous presidents, celebrities and even a few famous mafia members like Al Capone. Today, it is open for private and corporate events for up to 150 guests and hosts its legendary Holiday Brunches for Easter, Derby, Mother’s Day, Thanksgiving and Christmas. The Mezzanine Ballroom provides you with a number of flexible meeting options. The 3,400-square-foot ballroom is ideal for catered corporate events or special social events for up to 300 guests. When divided into four individual sections, each section can host meetings for up to 50 delegates. It is a wonderful space to use in conjunction with our Medallion Ballroom located just downstairs and connected via a curved, elegant staircase.